Pork belly might be the world’s most popular and beloved food. It’s considered a delicacy in dozens of countries throughout Asia, Europe and South America. 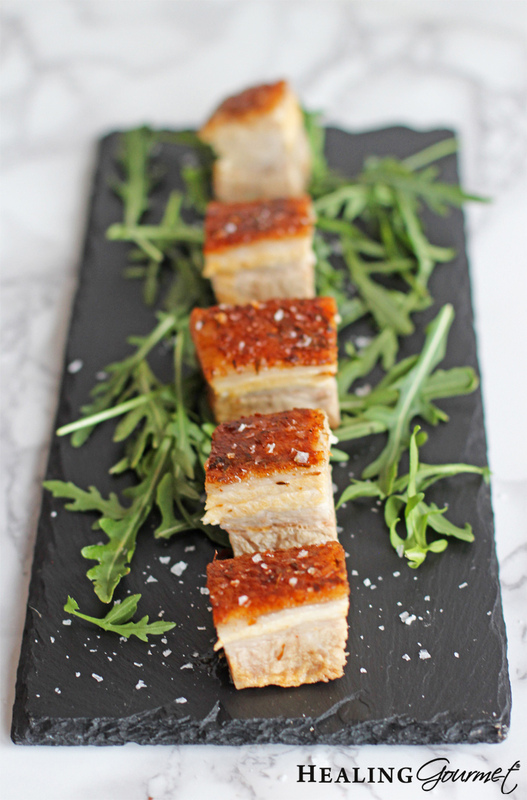 And we love our pork belly here in the States too… as proven by the menus of tapas bars and bistros across the country. As a testament to its popularity, the USDA reports that in 2017 national inventories of frozen pork belly hit their lowest levels in 50 years. Pork belly is essentially “better bacon”. It has more meat, more healthy fat and greater culinary complexity. One delicious bite of pork belly can be delightfully crisp, and yet succulently tender. It’s packed with the savory flavor of meat and satisfies our carnal urge for fat. Pork belly is so delicious, you probably feel guilty eating it. You might think to yourself, “This is so good, it has to be bad for me!” The truth is that this porcine delicacy can be a very healthy part of your diet (as long as you choose the right kind of pork and prepare it in a healthy way)! Is Pork Belly Healthy to Consume? As you probably know, conventional pork is not the way to go. These animals are raised in inhumane conditions. They are fed a diet (and pumped full of hormones) designed to fatten them as quickly as possible. They are also routinely administered antibiotics to fight off illness and infections which arise from their squalid conditions. Pastured pork, on the other hand, comes from animals that are fed a natural diet and allowed to roam and root. This kind of farming is better for the environment. It is better for the animals. And the meat that is produced is better for you too! Pastured pork is also a rich source of vitamins B1, B2, B3, B5, B6 and B12… as well as a good source of various trace minerals. 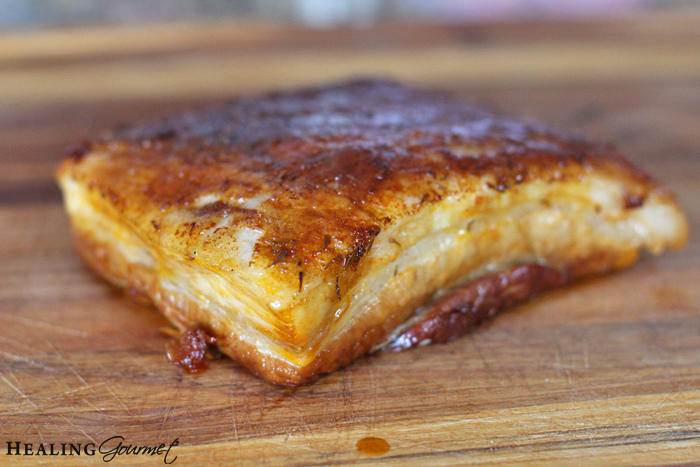 About 50 percent of the fat in pork belly is monounsaturated. These are the same heart-healthy fatty acids associated with the benefits of the “Mediterranean Diet” and for which avocado and olive oils are praised. These fats are known to help reduce belly fat, boost your good cholesterol and guard against cancer. 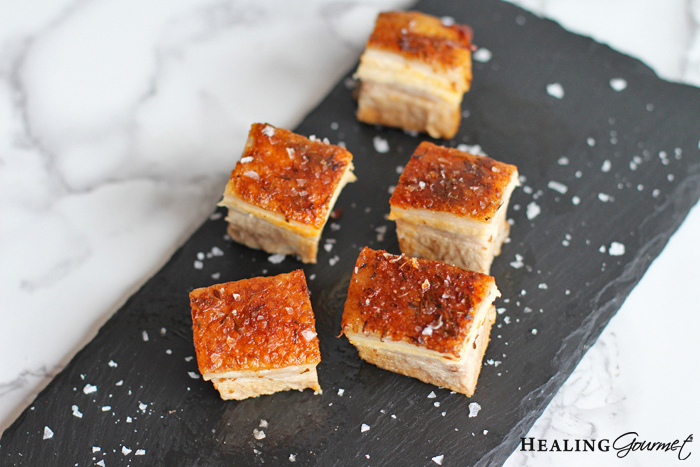 Another 40 percent of the fat in pork belly is saturated. This is another healthy fat to consume, despite outdated nutritional dogma to the contrary. Pork belly can be surprisingly difficult to cook. If you don’t cook it long enough, it can be very tough. On the other hand, if you cook it too long (or in an environment that’s too dry) it can become dried out and as tough as shoe leather. This is especially true if you choose a cut with the “skin on”. It is much easier to prepare (and to eat) with the skin removed. And easier still, if the butcher does it for you – so look for a cut without the skin. Today, using the amazing Instant Pot, we’ll show you how to prepare pork belly faster than any other method. It will be fall apart tender… and yet crispy in all the right places! Here at Healing Gourmet, we wanted to tackle this decadent cut with simple flavors so you could enjoy it in a number of different ways. In today’s recipe, we use manzanilla sherry to add a layer of depth beyond the delicious and savory meat. Smoked paprika rounds out the zesty wine for a complete, yet simple, flavor profile. If sherry is hard to come by, dry white wine or even apple cider vinegar will do the trick! And of course, pork belly is a fine complement to other meals, so be sure to keep some on hand for taco night… Paleo sandwiches… and a decadent breakfast of runny eggs and Keto Drop Biscuits for Sunday morning. If you’re aiming for something more traditional, you can easily change the seasonings. Instead of paprika, try a rub of ground thyme, sage and rosemary for a classic French approach. Or if you wanted to pay homage to the region where it’s most popular, rub the pork belly with ground ginger or a Chinese Five-Spice blend and add some fresh sliced ginger to the broth before cooking. We like to garnish this style with sesame seeds and sliced scallions. For purists: High quality sea salt and pepper let the indescribably delicious texture and flavor of pork belly shine through. The glory of pork belly is how flexible it can be, so get creative with your favorite toppings and experiment to create your own signature pork belly recipe! In a traditional pork belly recipe, the meat can take over six hours to roast. And it needs regular tending during that time. If you don’t have half a half a day to spare in the kitchen, you’ll love what you can do with the Instant Pot. This magical device cuts cooking time down to just under an hour and a half. And that’s hands-free time, so you can tend to other things. The pork belly recipe below calls for just five minutes of prep. The Instant Pot does the rest. Once it’s done “roasting,” we like to give it a crispy oven sear with decadent (and healthy!) 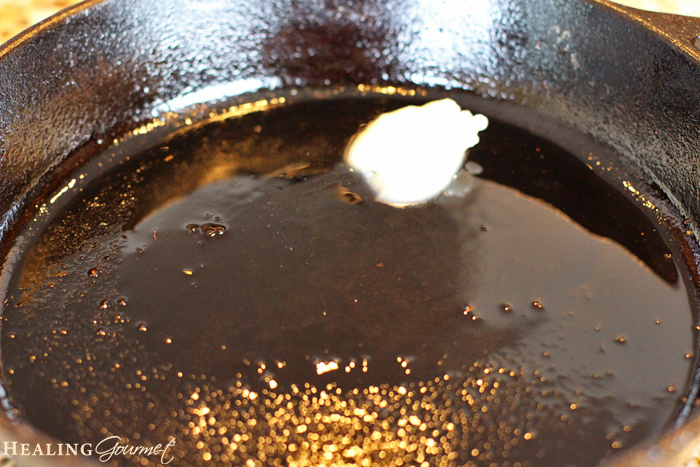 duck fat… and voila! Crispy, juicy, rich pork belly bites are ready and waiting! So, what are you waiting for? First, gather your ingredients. You’ll need a one pound pasture-raised skinless pork belly, a teaspoon of sea salt, a teaspoon each of smoked paprika and thyme, four cloves of garlic (sliced or chopped), half a cup of broth and one-quarter cup sherry (or white wine), a little duck fat (tallow, lard or coconut oil are great too). 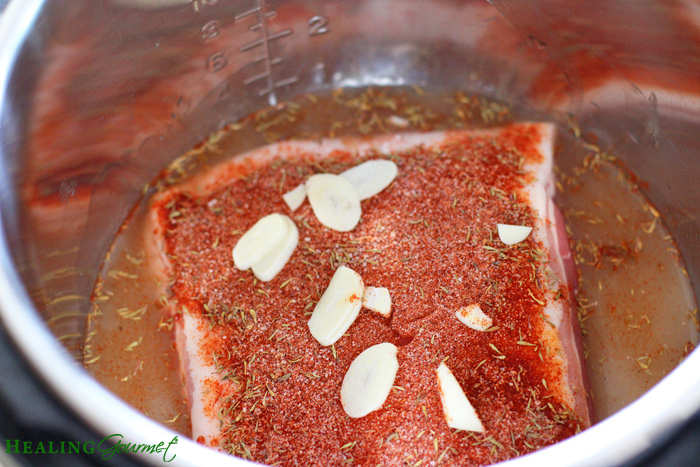 Now place the pork belly in the instant pot, spice side up. Allow to cool slightly, then gently transfer to a cutting board. And get ready to delight in these little bites of heaven! Rub the fatty side of the pork belly with the salt-spice mixture. 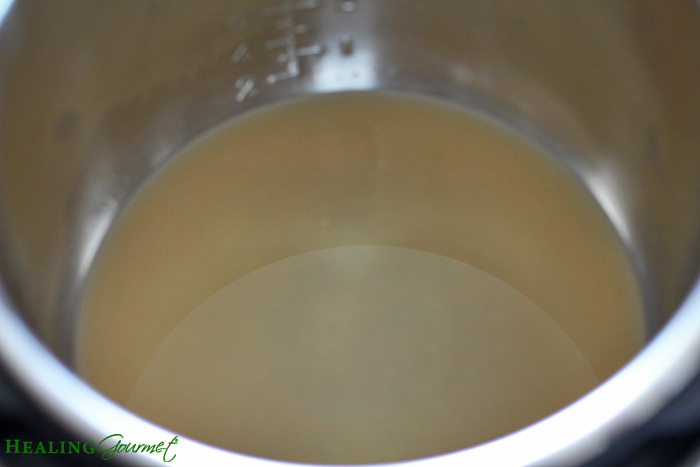 Pour the broth and the sherry into the Instant Pot. Close and lock the lid. Set the pressure to HIGH and the time to 80 minutes. A few minutes before the time is up, preheat your oven to 400 F. Place a couple tablespoons of duck fat in a cast iron pan. Transfer the pan to the oven to get nice and hot. When the time is up, use two spatulas to lift the cooked pork belly out of the Instant Pot. It will be very tender and may fall apart if you use tongs. Remove any large bits of garlic or spice and place the pork belly fat side down in the preheated cast iron pan. If your pork belly has curled, top it with another cast iron pan to weigh it down. Then pop into the preheated oven for 20 minutes, or to your desired crispness. Using a sharp chef’s knife, cut into cubes. Sprinkle with a little more sea salt (Maldon is preferred). Wow… this recipe looks amazing! We love pork belly and are glad to know that the majority of fat in this delicious cut is healthy. I don’t like that most recipes take hours to prepare. And yes, we’ve had some tough results before (especially when using a skin-on cut). Can’t wait to try this. We’ve never made a Healing Gourmet recipe we are not happy with, and I suspect this will be another winner! Your kind words made my day – thank you. Can this be done in a regular pressure cooker as well? Would there be any changes to ingredients or timing? I have never been inclined to leave a review of a recipe before…. that being said, this turned out amazing! Done exactly as written except I used a 2 lb belly in my cooker, doubled the spices and kept the cooking time the same! Exceptional! Recipe was easy to follow and the results were as promised! I’m so glad you enjoyed it. I actually just made it last night with a twist of fresh rosemary an it was delicious. It is my 6-year old son’s “favorite meal”! 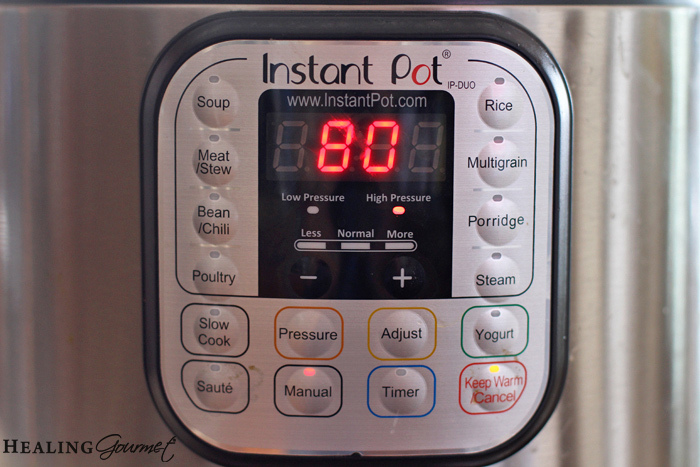 When the time on the Instant Pot is up, do you use the immediate pressure release or the slow, natural pressure release? Planning on trying this tomorrow. It looks wonderful! Thanks for your question, Karen! You can do either one. When I have time, and if it is meat, I always do natural release as it continues to cook and tenderize the meat for that time. Hi Kelly. I have a beautiful (frozen) boneless 2kg (just under 4 pounds) pork shoulder roast to cook and thought I might adapt your recipe/cooking method for it. Do you think it will work? Appreciate any tips please as it’s a huge piece of meat – pastured pork from very good, ethical source. I have a pressure cooker that it will fit into whole. Cannot wait til tomorrow. Got my organic p.b. plus duck fat from my county butcher, will use marsala wine. Looks fantastic. I hope you love it, Mary! Can you please add the step for when you’re supposed to add the garlic to the actual instructions? It’s clear from the photos that it should be added before closing the pot, but it’s not clear in the written instructions. 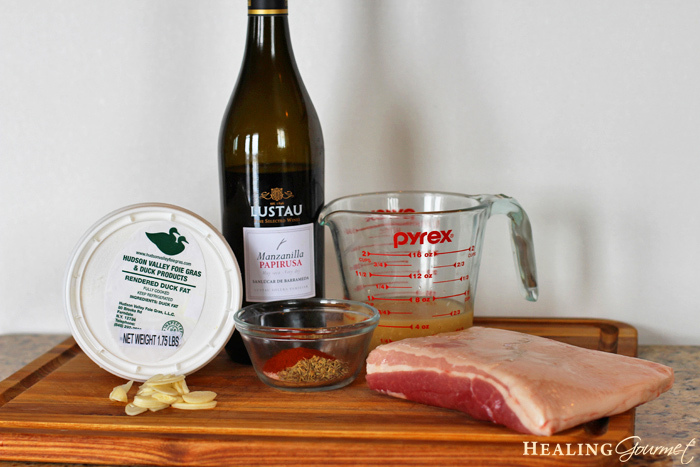 Did you use skin on or skinless pork belly. Looks yummy! Im confused because the photos clearly show with skin. That said, I made it and it was delicious. Also added a quartee cup of soy sauce into the mix. Unfortunately I am unable to print this recipe. I have no problems with printing recipes on other sites. Where should I start? 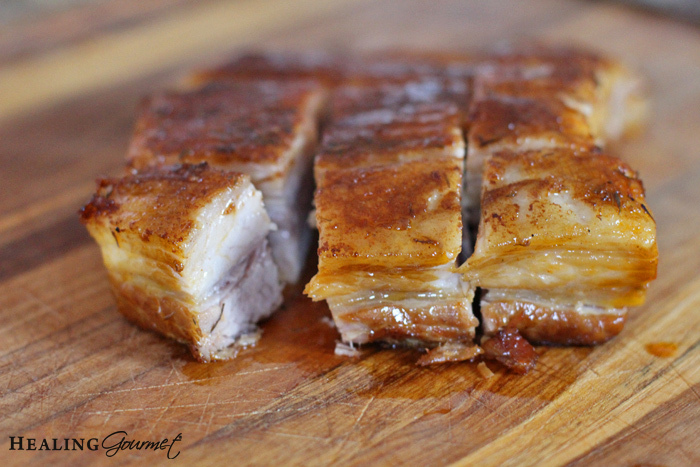 My first time using Instant Pot and also cooking pork belly… The result?? Total SUCCESS!! My kids and my husband LOVED it! They all praised the balanced flavor and how the pork just melts in your mouth. THANK YOU for the easy and delicious recipe! I’m so happy you enjoyed the pork belly… and that your first try with the Instant Pot was a success. Once you get a feel for the basics of the Instant Pot, you’ll be amazed at how almost any recipe can be used in it. I’m working on a Keto Cinnamon Roll in the Instant Pot this afternoon. Who knew? I’m looking forward to making this tonight! Is the pork placed on a trivet or directly in the broth? Does anyone have any suggestions for sides? You can place it directly in the broth. I love to serve it simply with a green salad, or sometimes over creamy cauliflower mashers for a real keto comfort food treat. I also switch up the spices and do an Asian-style pork belly that I then dice and use in cauliflower fried “rice”. where do you purchase your pork?? I would be concerned as to what the animal is being fed – GMO corn? – with BT. Some animals are fed good products that aren’t GMO but are then “finished”, for the last part of their life by being fed GMO corn (or maybe GMO soy), to help fatten them up. I would suggest you look for pasture-raised pigs that have not been “finished” with GMO corn. Something to consider esp. when it comes to how it could affect your health and well-being. Why didn’t you take the time to read my article before commenting? The section “Is Pork Belly Healthy to Consume” is all about why you should choose pasture-raised and the benefits of doing so.